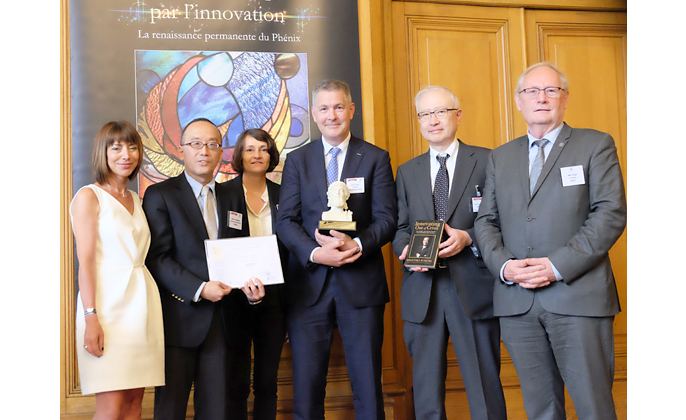 FUJIFILM Corporation (President: Kenji Sukeno) has been awarded the Hermes Award for Innovation, organized by the Paris Club and the European Institute for Creative Strategies & Innovation, in the category of Best Strategy of Innovation. The Hermes Award for Innovation was established in 2009 to extend recognition to companies that have introduced the highest level of knowledge to products and services to enhance public and social satisfaction. The decision to grant the honor to Fujifilm came after Paris Club’s visit to Fujifilm’s Open Innovation Hub at the company’s Tokyo head office in March this year. Paris Club officials praised how Fujifilm has reinvented itself from primarily a photographic film business into a diversified corporation amidst the contraction of the photographic film market, while also recognizing the company’s active approach in applying its proprietary technologies, developed in the photographic business, to a variety of business fields, and working with external business partners for “co-creation” of solutions to future social challenges. The Open Innovation Hub is a facility that allows business partners to have first-hand experience of fundamental and core technologies that underlie excellent materials and products developed by the Fujifilm Group, as well as fresh technologies, materials and products currently under development. From the experience in The Open Innovation Hub, business partners can engage in “co-creation” with Fujifilm, initiating a tide of innovation with epoch-making products, technologies and services. At present, the Open Innovation Hub has been set up in Japan (Tokyo), the Netherlands (Tilburg) and the United States (Silicon Valley), facilitating open innovation activities in line with the characteristics of the respective regions. The Fujifilm Group will continue to make maximum use of its diverse resources to create products and services that truly capture customer needs, thereby delivering new values to society. Paris Club is a business organization consisting of 88 leading companies in France. It is positioned as one of key organizations facilitating a network of innovation among companies in Europe.